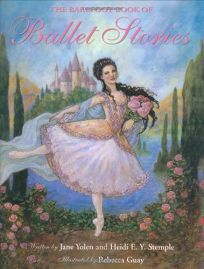 Readers can dance through the pages of The Barefoot Book of Ballet Stories by Jane Yolen and Heidi E.Y. Stemple, illus. by Rebecca Guay. The compendium contains seven stories from across the centuries and continents (including ""Swan Lake,"" ""The Nutcracker,"" ""The Sleeping Beauty"" and ""Daphnis and Chloe""), prefaced by an introduction that discusses the dancers and composers who brought each ballet to life. Guay's (Goddesses: A World of Myth and Magic) paintings show fairies, princes and others in graceful and expressive poses. .